THE intention was to toast the Madrid launch of an alcoholic drink. 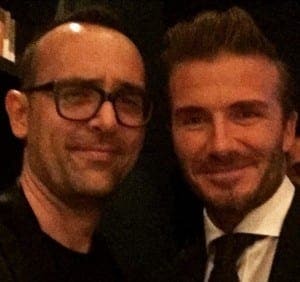 But things got personal in a provocative selfie between television Risto Mejide, 39, and David Beckham, 40. In a twitter post, Mejide wrote: “Okay, he has more hair, more success, better looks, he’s nicer and has more money than me. Aside from his glamorous model girlfriend Laura Escanes who, at 19, is 20 years Mejide’s junior… not a lot!